In the midst of the holiday season, as we are inundated with yummy treats, parties, and excessive everything consumption, it’s time to take a stand. Carbs are officially the enemy. I’m trying to keep the holiday pudge at bay by eating clean during the week so I can let loose (and loosen up my belt) on the weekends. That means lots of low calorie, low carb weekday dinners. 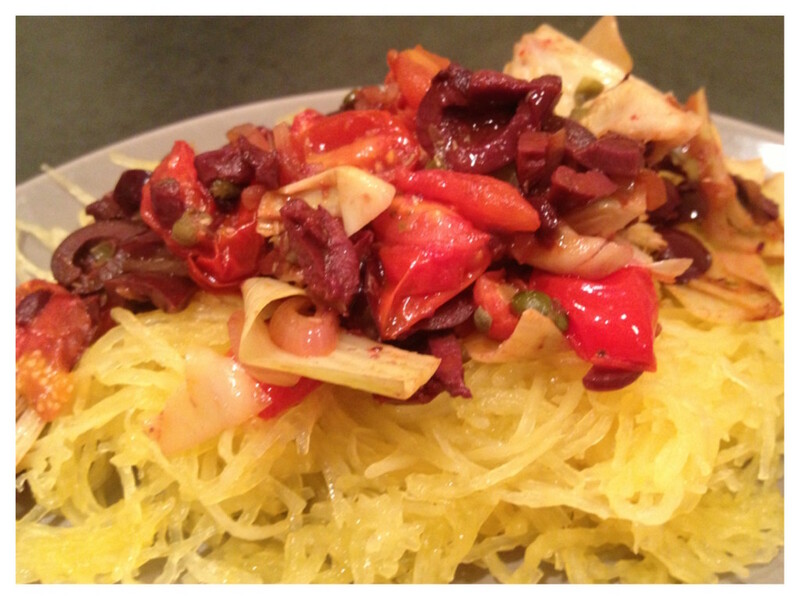 Like last night’s Spaghetti Squash. Prepare squash by cutting it down the center (CAREFULLY), scooping out the seeds. Rub olive oil and a little sprinkle of sea salt on flesh, and place it cut side down on a baking sheet. Roast for 30-40 minutes until the side can be poked easily with a fork. Meanwhile on the stove, heat a tbsp of oil in a small skillet over medium heat. Add shallots, stirring, until beginning to color, about 2 minutes. Add tomatoes and artichoke hearts, gently stir a few times until softened. Then add olives and capers, cooking for about 30 seconds more. When the squash is done, remove it from the oven and let cool for 10 minutes, then scrape the insides out with a fork onto a plate and spoon the tapenade over it. Freely season with sea salt, fresh basil leaves, or any dried spices that float your boat! Additional Tip: If you are short on time (or patience) you can make the squash in the microwave. Put 1/2 squash cut side down in a glass dish. Fill dish 1/2 way up with water. Microwave on high for about 10 minutes. Carefully remove it and let squash cool before handling. 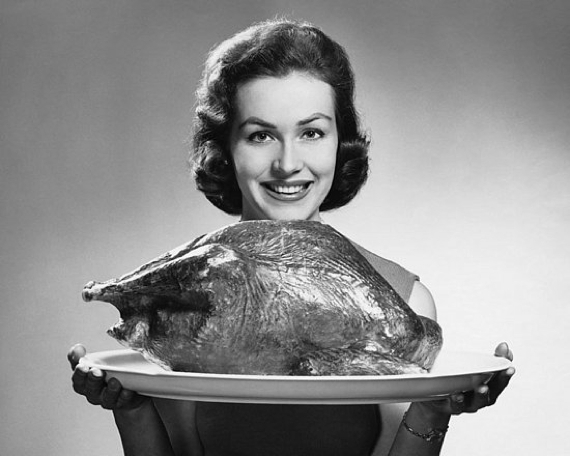 This year will be the first annual Heatherland Thanksgiving. Between mimosas in the morning, some baked brie and apples for lunch, and all this for dinner, I would say I need big, big, workouts in the days that follow. Unless I want to surrender to stretch pants through December… Not hot. 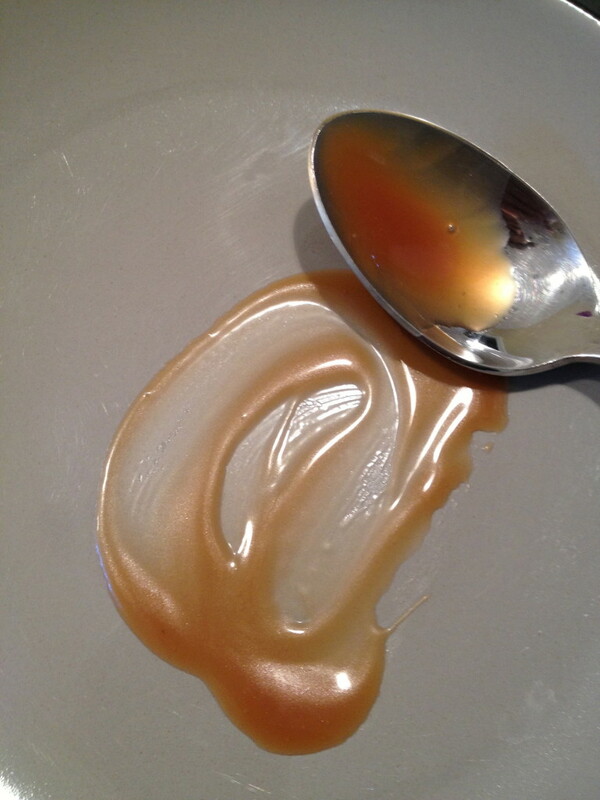 Salted Caramel Sauce For All. 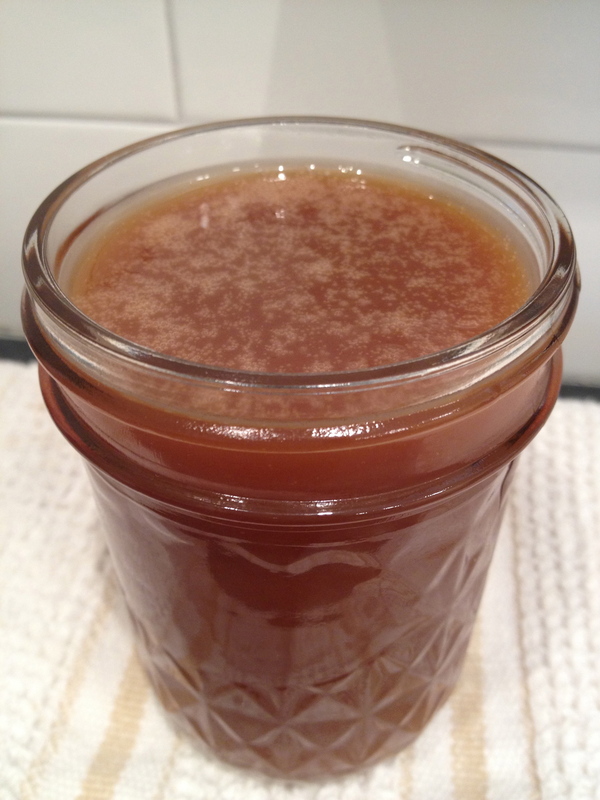 When the seasons change from Summer to Fall, there is one thing that tastes like that change: Salted Caramel Sauce. Rich, warm, velvety sweetness dripping over baked apples, or cheesecakes. Yum. This recipe moves quickly, so gather up everything you need and keep it on a tray near the stove before you begin. Get a heavy-bottomed pan set up over medium-high heat. Pour in water and sugar, stirring just enough to get the sugar to dissolve. 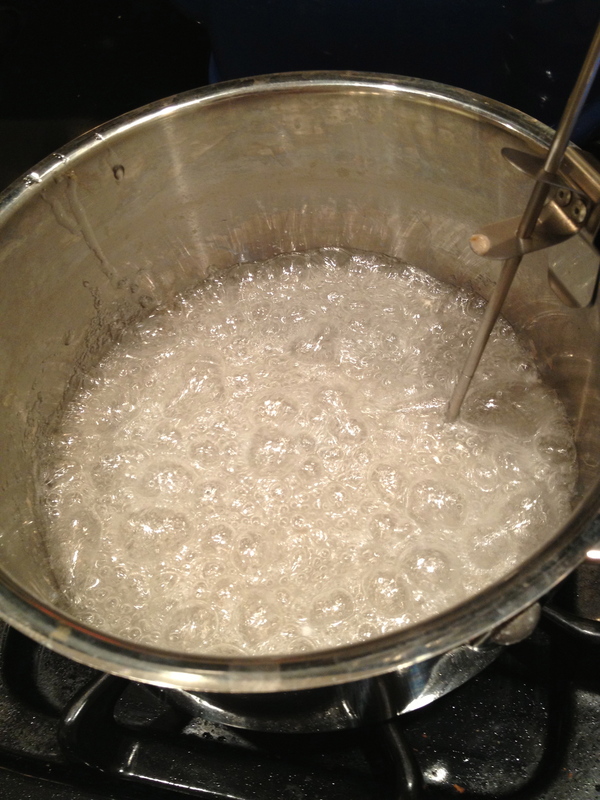 Set up the candy thermometer (mine clips to the pan) and let the sugar boil to 320-330 degrees. 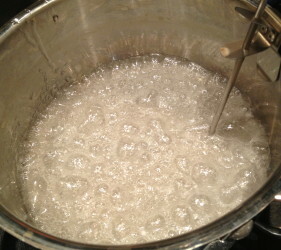 Immediately add the butter to the boiling sugar and whisk until melted (it will bubble and foam so be careful). 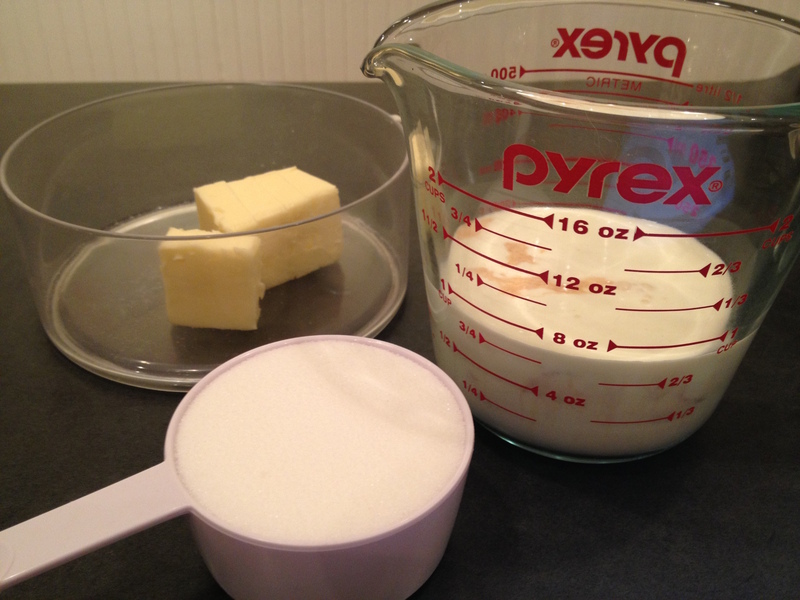 Remove from heat and whisk in cream (it will bubble again), then whisk in a generous pinch of fleur de sel. 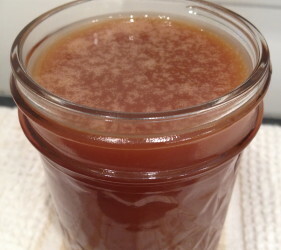 Let the caramel rest for five minutes before pouring it into a glass jar. It will last up to two weeks in the fridge. Quick Tip: Sometimes a burner will get hotter in one spot than others, pay attention to your boiling sugar, if you notice a hot spot that is browning quicker than the rest, carefully turn your sauce pan so that one spot won’t burn. 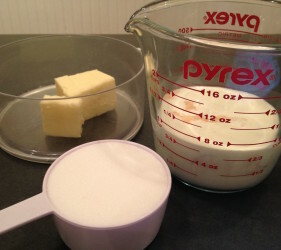 This is a quick recipe to throw together in a pinch. I made a Pumpkin Cheesecake this past weekend and I could actually feel the light bulb go on over my head: “It needs salted caramel sauce!” 20 minutes later it was done.